I am intrigued by the 100-mile wilderness and wanted to spend a few days hiking in it. 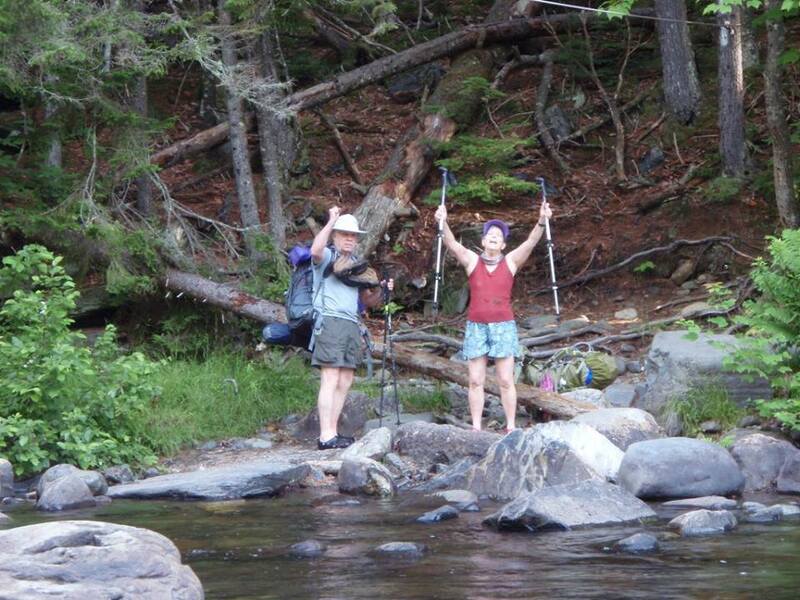 My niece saw my Face Book posts about Baxter State Park and sent me a text that her in-laws, Jim and Marge, live in Monson, ME. Perfect! Gay and Steve dropped me off at their house. Jim and Marge were wonderful. Jim took me around town and introduced me to some interesting people including Poet and Hippie Girl at Shaw’s and Patty Harding (Lacy), A.T. Ambassador of Monson, ME. 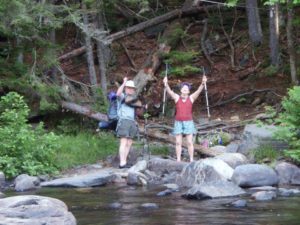 We went to Lakeshore House Restaurant for dinner and met two young SOBO women who had just finished the 100-mile wilderness following their Katahdin hike. They were friendly and excited about their accomplishment so far. The next morning, Jim dropped me at the southern end of the 100-mile wilderness. About a mile in I noticed that I had forgotten to change shoes. Instead of wearing my nice Merrell hiking shoes, I was wearing a cheap pair of joggers from WalMart. It had rained the previous day and the trail was very slick. I slipped numerous times on the rocks and fell three times. Fortunately, there was no major damage, just a bruised hip and a sore toe. 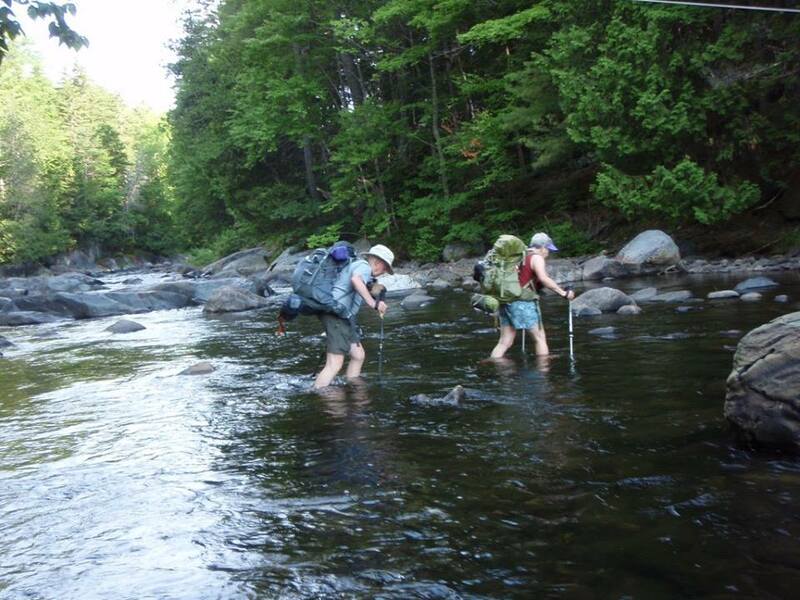 I hiked for a while with a couple (TeaSip and JavaMan) who had hiked the 100-mile-wilderness a number of years ago. They said they did not remember it being this hard. They stopped for the night about a mile before me and I continued on to Big Wilson Stream for a 9.7 mile day. It was dusk, so I put up my tent and had dinner, then turned in for the night. I don’t know if it was the hiking or the white noise of the stream flow, but I slept better that night than I have in years. 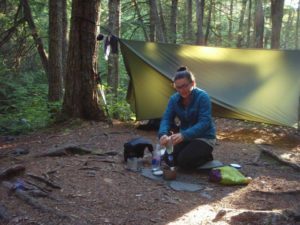 In the morning I decided that I wanted to have some leisure time in the forest, so I took my time eating breakfast and packing up my gear. Part of my decision was to head back to Monson, but do it slowly over a few days so I could camp a couple more nights. I planned to wait at Big Wilson Stream until TeaSip and JavaMan came. One man came while I was waiting, a section hiker going south. I watched him cross. He took his time and made it with no problem. When TeaSip and JavaMan came, I chatted with them while they changed from hiking boots to Crocs. I told them I would take photos and send them to their e-mail. I only hiked about 3 miles to the Little Wilson Stream campsite, getting there at about 2:30 p.m. This would be a good location to have a privy. This area was obviously used frequently, in fact overused. Numerous pieces of toilet paper marked previous cat holes. I recommend people read this before hiking: https://sectionhiker.com/how-to-dig-a-cathole/ . After a couple hours, I was joined by a couple from Scotland. 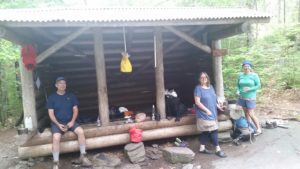 John and Ruth were hoping that by the time they complete their trek through the 100-mile wilderness there will be a reversal on the decision to leave the E.U. (like it was all a nasty joke). We also joked about a certain presidential candidate’s relationship with Scotland. Emma joined us a short time later. 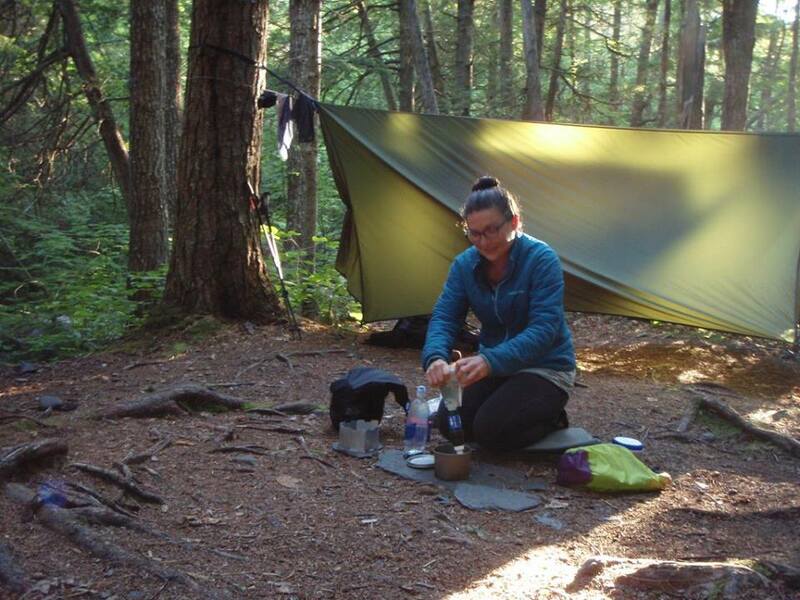 She is a SOBO thru-hiker and hammock camper. I was pretty impressed with how quickly and easily she set up. Made me start considering changing to a hammock. We made a campfire and prepared our meals. John and Ruth used an Optimus stove. Emma used an alcohol stove. I have an old Svea stove (too heavy, but burns great). Emma’s alcohol stove had boiling water in no time. I was surprised at how efficient it was as I had never seen one in operation before. I crawled in my tent at sunset and woke up at day break (another great night’s sleep). Planning another short hiking day, I had leisurely morning, ate breakfast, and visited with my co-campers while they packed up and said goodbye. Afterwards, I finished packing and hit the trail. The day hiking was uneventful. 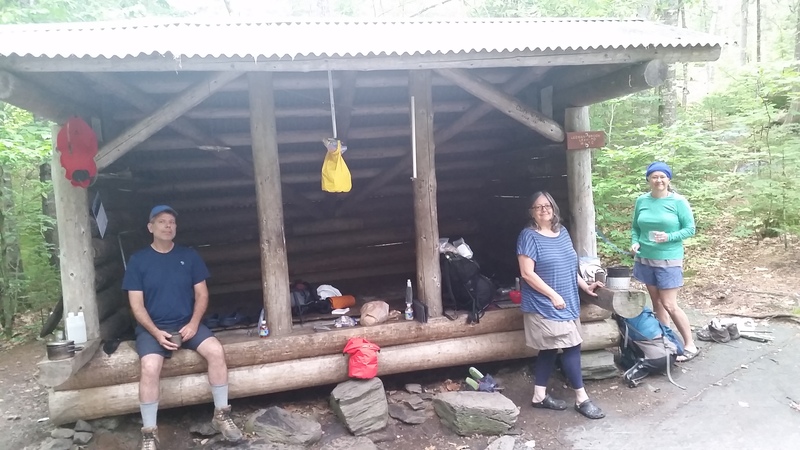 I hiked 3.8 miles to Leeman Brook Lean-to. At Leeman Brook, people started showing up pretty quickly, all SOBOs planning to get into Monson the next day. I set up my tent 100 feet from the shelter, and then came back to the shelter to meet Bobcat, Walking Bare, John and Firefly, and a man whose name I did not get. Bobcat was quite interesting – she said that she was not treating her drinking water at all….no filter, no drops. I hope she has a superior immune system. Bobcat found a flat piece of ground and said she was going to cowboy camp. Walking Bare (I asked how it was spelled and got the story – which did not have anything to do with the Summer Solstice). He was in his early 20s and from Switzerland. John, Firefly, Walking Bare, and the other gentleman set up to sleep in the shelter. While we were cooking dinner and eating, Hoo Doo Mama, Deacon Blues, and Hell Yeah! arrived. This group set up two tents in a clearing a couple hundred feet from the shelter then came up to join in the conversation. They were imbibing some sort of adult beverage and livened up the conversation for a while, but at hiker midnight the thru-hikers started climbing into their sacks and things settled down. Bob Cat decided to set up her tent. I got in my tent and was drifting off to sleep when two more hikers showed up. After rattling around a a bit, they continued up the trail a little way to find a place to camp for the night (I saw their tent when I walked up to the privy in the morning). They never did interact with the rest of the people at the shelter. In the morning, I hung around while the SOBO thru hikers packed up and left, anxious to get to Shaw’s for breakfast. I talked with Hoo Doo Mama and Deacon Blues, a married couple, and Hell Yeah!, HooDoo Mama’s sister. They were northbound and just planning to hike the 100-mile wilderness. They are all from Florida, but Hell Yeah! is a PhD Botanist who now teaches at a small college in Georgia. Deacon Blues is an adjunct professor in the music department of a small college in Florida, where my daughter happens to work (small world). They were still there when I left. I only had three miles to hike and was back at Maine Hwy 15 by noon and called Jim (my niece’s father-in-law) for a ride. While I was waiting someone from Shaw’s dropped by and offered me a ride. I thanked him and told him my ride was on the way. Privies are nasty and smelly, but better than the alternatives. Hikers all seem to be willing to talk about and give advice on gear. 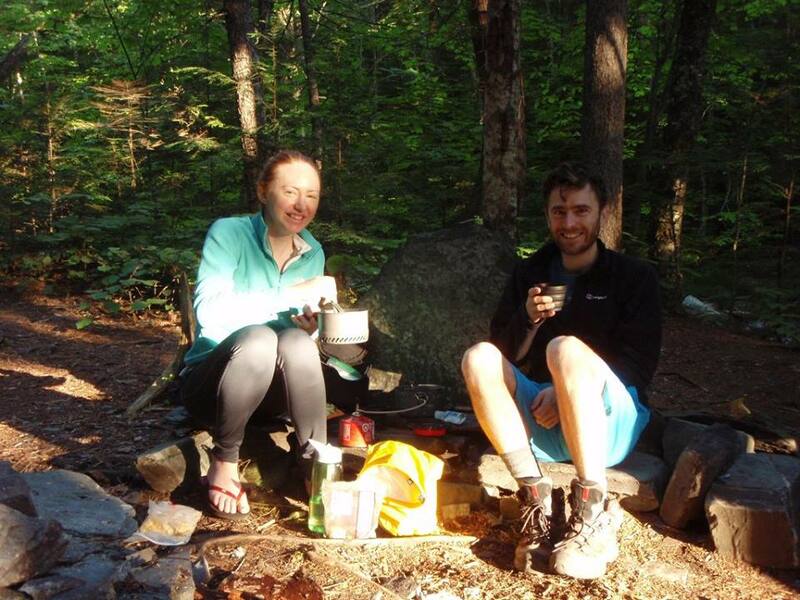 Several hikers that I met were using alcohol stoves. That seems to me to be the way to go. The jury is still out on getting a hammock. I will use my Big Agnes UL 1 for the time being. Net savings: 7.4 pounds. That’s like a ton! That’s some impressive weight savings, easily accomplished. Thanks for providing those details (and for doing the math for us). A lot of traffic in those long woods! I think you are one of the bravest men I know and I’m so proud of you for following your dream. I signed up to get your blog so I can follow you on your trip. Be safe and happy sleeping under the stars! After all you have been through, that is a real compliment, Beth. Thanks for following. See you in 6 months, or so. since the day I retired in the army last 2011.